So the other day I was rambling about how you couldn’t visit Yangon without paying your tributes to Shwedagon Pagoda – and while I still think that’s true – there’s so many other places that you just can’t miss when visiting Myanmar for the first time. Among these endless must-sees, some do still stand out: For example because they are a world famous, jaw-dropping, cover-of-every-guidebook, seemingly resisting the laws of physics kind of place. 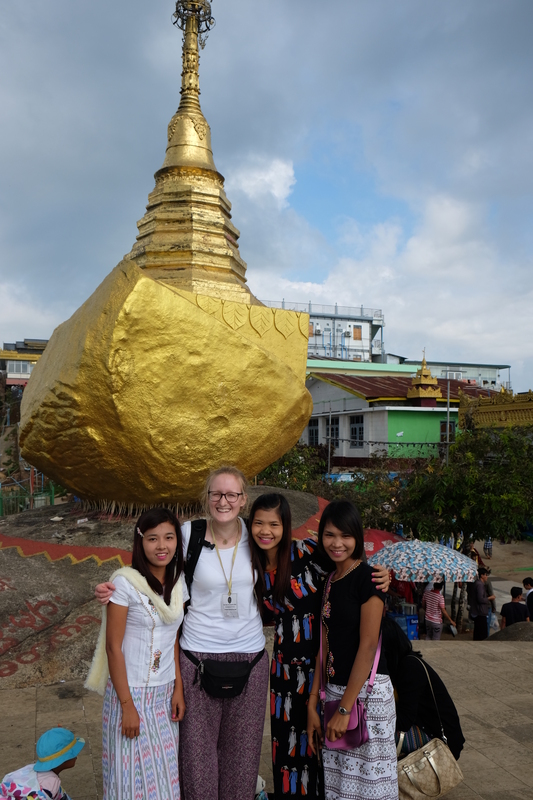 All of this (and so much more) is true for Kyaikthiyo, better known as the Golden Rock. For all of the obvious reasons listed above, we had to to see it for ourselves. 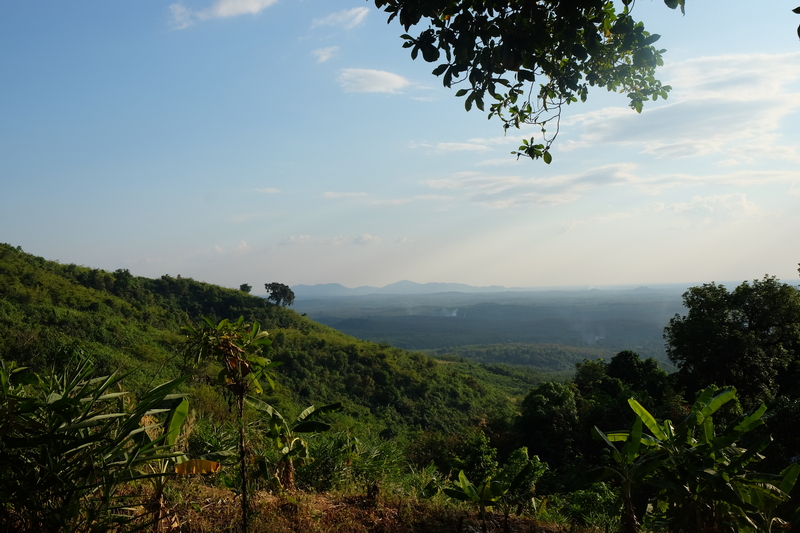 Now I’m usually not the kind of person and/or traveler to claim they have everything figured out (cause I usually don’t), but for some reason, every decision made about our trip to Kyaikthiyo turned out just right. So ultimately, what I am looking to share today is nothing less than the perfect visit. 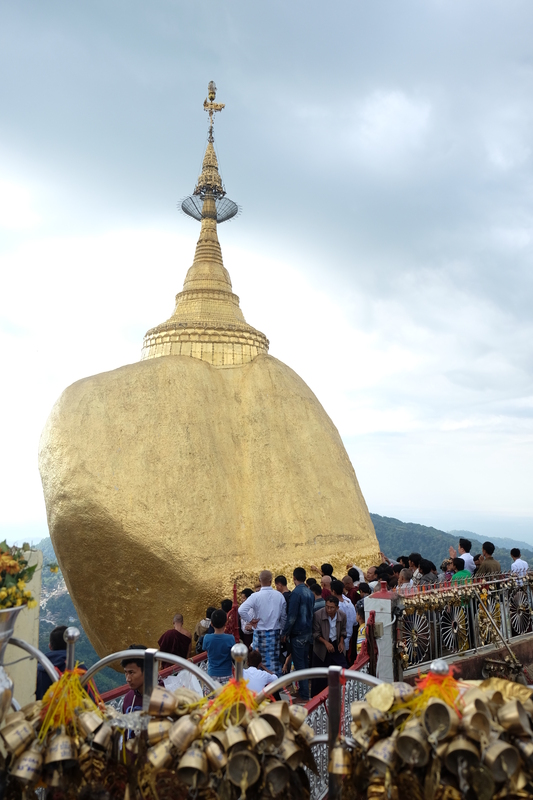 With many people flying into Yangon as their first destination in Myanmar, the Golden Rock comes as quite a natural place to visit during your first couple of days because of it’s proximity to the city. 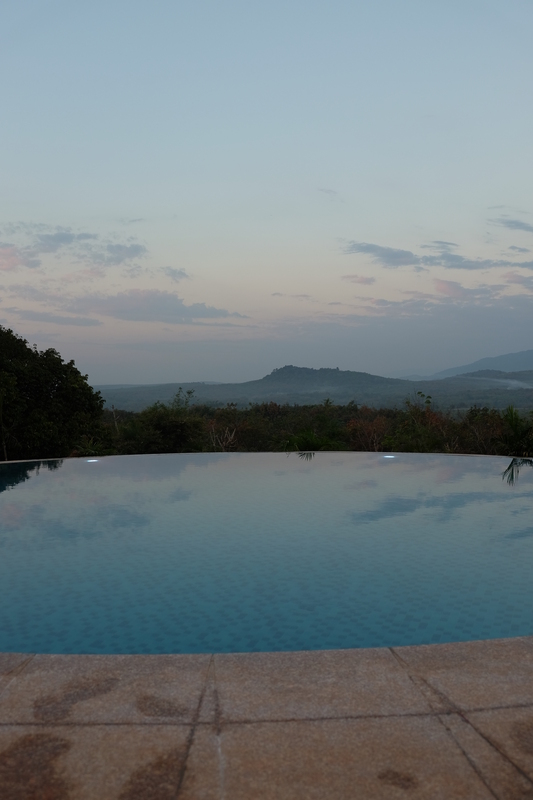 With only 170 kilometers, it is so close that many people seem to prefer visiting it in a day trip. That has some upsides to it: Accommodation is rather cheap in Yangon and with the streets being fairly good, you can get to your destination in around three hours by bus (or even a little less if you’re willing to pay a lot more to go by car). 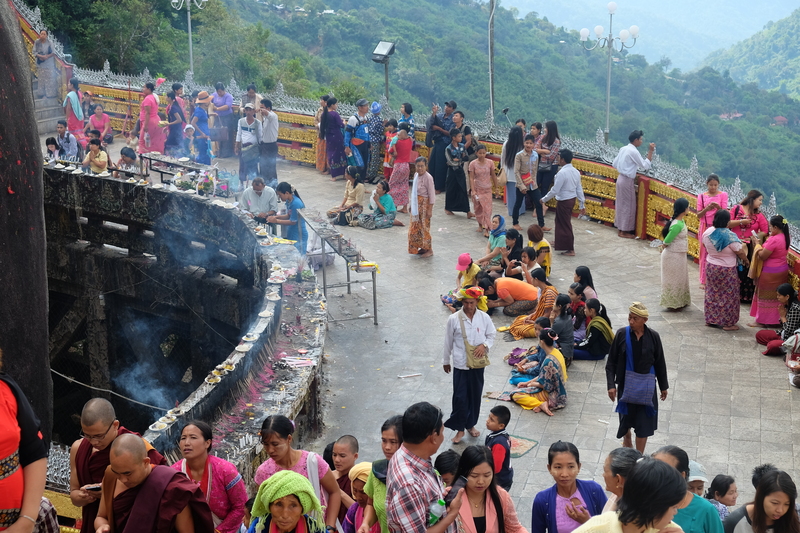 We all know that while traveling, we want to make the most of our time, so I see why taking a day trip from Yangon to the Golden Rock can be a tempting opportunity. Your day could look like this: Leave Yangon let’s say at 5 am, be there at 8 for breakfast, up the mountain by 10, wander around, back down after lunch, catch the bus back in the late afternoon and reach Yangon just in time for dinner (regular meals are literally more important to me than any other plan). Random picture of me eating to substantiate that. So if you really want to see as much as possible at all costs, that’s probably your way to go. While I do see the advantage that comes from “doing” a whole place in a day, I somehow didn’t feel like it was the right thing for us to do here. I know it may sound odd and as I said before, I’m not a religious person, but somehow I felt like it wouldn’t really credit the place as to the highly important pilgrimage site it is, to come and go in a day. Instead, I wanted to let it sink in a bit – and I was not disappointed at all by that decision. We made our way from Yangon to the Golden Rock at around 8 pm by car (because the bus schedules didn’t really work out for us but also because we’re obviously idiots sometimes). 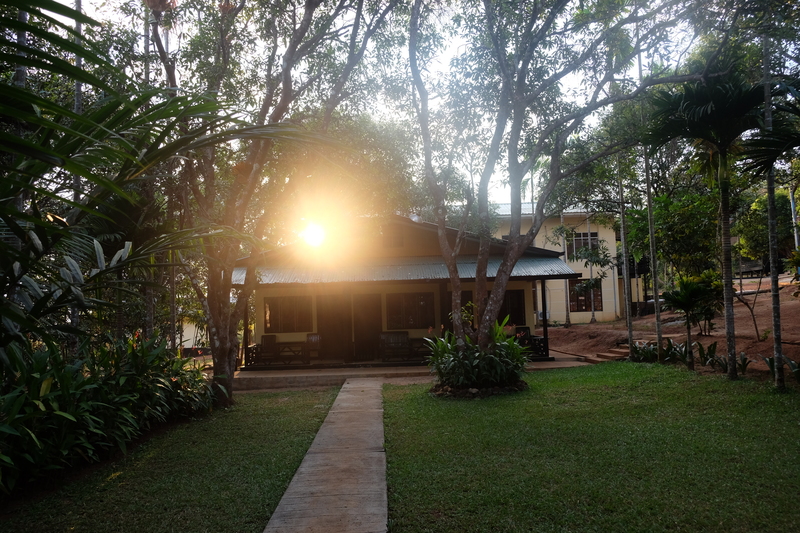 Actually where most people stay is for example at Kinpun, which is the “base camp” to the Golden Rock. 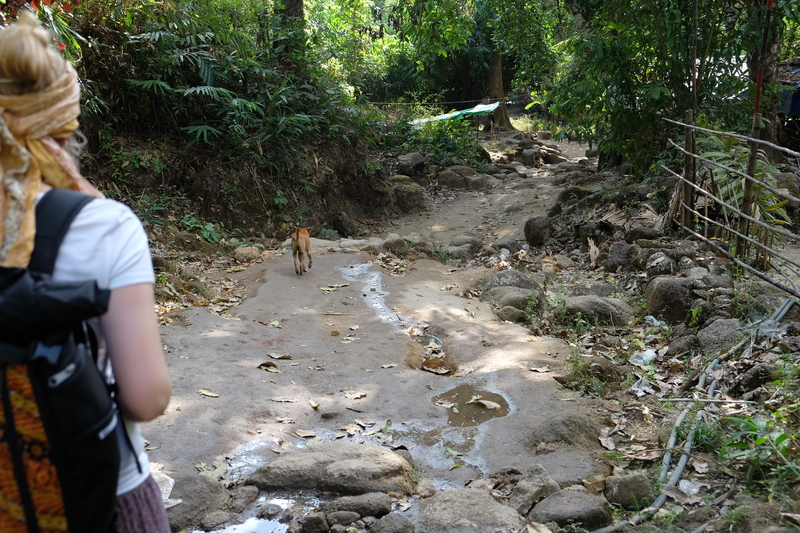 We had decided not to stay in the middle of the hustle and bustle of the lively town, but stayed at a very peaceful and quiet place instead – imagine wooden bungalows in a huge garden with puppies running around. Our great stay (sadly, no puppies to be seen). We started our day off with a breakfast of scrambled eggs and fresh fruit in said garden instead of on a bus – and a ride to Kinpun that set the spirits right for the adventurous means of transportation waiting for us that day: So first, to the scooters! Not that we drove them ourselves (forbidden to tourists except for e-bikes in Bagan), but sitting in the back awkwardly while two relatively small and light-weighted guys of the hotel staff drove us there. 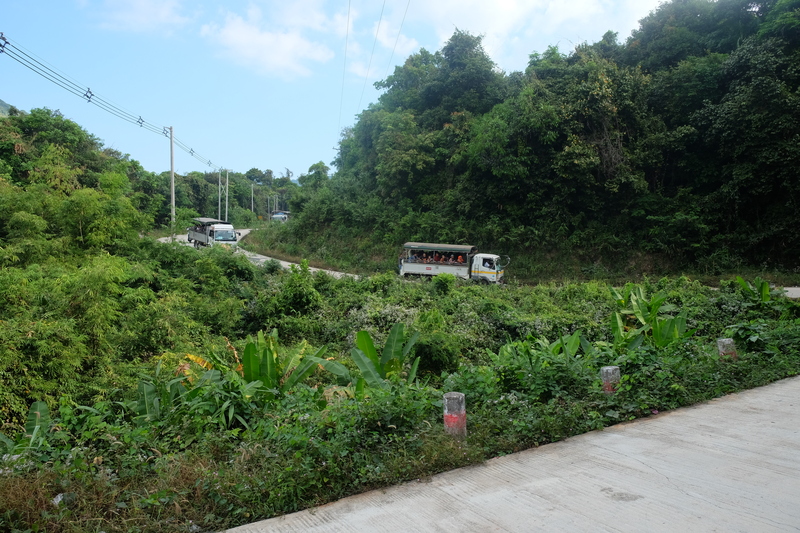 As you can imagine, we were a bit hesitant to take that ride, but it was scary only for a minute or two, the other twenty were all fun and laughter, and when we reached our destination, we were ready to face the real scary ride. The Golden Rock is about a 1000 meters higher than the base camp at Kinpun, and there’s two ways of getting up there: it’s either hike or truck. We had thought about doing the hike up at first, but then chose what we thought the more relaxed way: Up by truck, down by feet. Now these trucks are running from the base camp to the top of the mountain all day long, from sunrise to sunset, and there’s one departing every other minute, so let’s just say: there’s many of them. Each of the trucks has rows of steel benches on it’s loading area, so that they fit almost 50 people at a time. 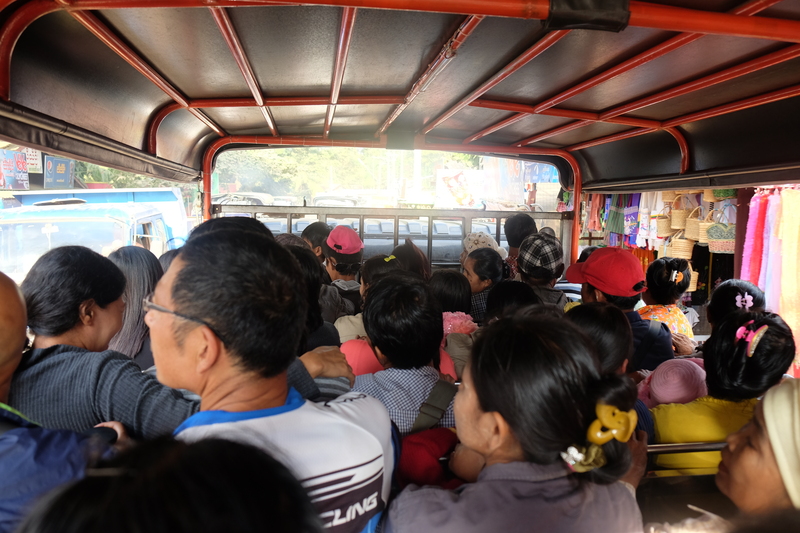 What happens there at the base level was so hilarious to us, because obviously there’s no explanation or anything, you just approach one of the dozens of trucks waiting there, climb the ladder and wait to be seat, which I mean literally, because they will make sure to fit as many people in the back as possible. The truck ride takes about 40 minutes, but looking back now, it feels much more like 5 minutes because I spent most of the time laughing like a mad lady, trying to hide the fact that I was SCARED TO DEATH. It was like a real life rollercoaster, except no security measures could be taken whatsoever, apart from gripping the steel handle in front of you veeeery tightly. I mean, it’s not that you could possibly be shaken up all too much even in the craziest turns because you were crammed in so tightly with the other passengers but MAN, that was a crazy ride. While the truck was racing about like the drivers were having a daily contest about who can make it to the top fastest (maybe they do? ), I did my best not to freak out at the angle we were leaning into at every nauseating turn. Because the street was so narrow, we had to stop occassionally to let another truck pass, and I made use of these little breaks to catch my breath and enjoy the view that comes with being sky-high in the mountains. When we finally reached the top, I was still laughing – and I can’t say that I was disappointed that we wouldn’t have to go through this again that day (I can only imagine it would be so much scarier going down). I have to admit that I had no idea what to expect up there apart from the actual gravity defying rock – but I was still so surprised when I found the place to be such a busy, crowded pilgrimage camp really. There were restaurants and shops everywhere, people selling devotional objects, others offering to carry old or weak pilgrims in palanquins (or tourists made from money), whole families bustling along clutching bags of food, many many monks and nuns, cats obviously, kids dressed up in their fanciest clothes and everything was just insanely colourful and bright and busy and lovely. We started to move along with the crowds and couldn’t help but notice that although many of the people were obviously tourists, we were almost the only westerners around. Not that anyone cares really – but it is a piece of information that is key to understanding why the hell everyone was SO interested in us. It was only here that we first noticed people staring at us with this friendly mix of bewilderment and curiousity. I mean, it sure had happened in Yangon before, but the number of people seemingly dazzled with our presence here was simply incredible. It didn’t take long before the first ones tried to sneakily take selfies with us in the background and I just couldn’t help but feel so, so awkward. I didn’t really know how to react, but then finally someone asked us to take pictures with them, and we happily did, smiling our brightest in each of them. That led to more and more people approaching us, motioning their smartphones at us, and we ended up taking SO many pictures, it was hilarious. I know this happens to many travelers in Asia (and elsewhere probably) but to that extent I had never experienced it and it was so fun to chat with all these people or just exchange smiles and then wave each other goodbye. As a blond girl, it was absolutely impossible for me to blend in, but Marvin got his share of selfie requests, too, because he was seemingly like one meter taller than everyone else around. While men are also the only ones who can enter the little “balcony” from where you can touch the rock, everyone can go to the terrace stretching out under it, which is incredible. You never see it in the famous pictures because obviously it looks so much more dramatic if you think that there is a crazy abyss right under the rock. But the feeling of standing there right underneath it is so impressive. I mean, it is one thing to see that block of concrete balancing on that edge – but it’s totally another if you’re standing right under it and think about the legend that it is but a wisp of the Buddhas hair that keeps it in place. While looking around, we took many more pictures with other visitors and I started to reflect a bit on my own approach at taking photos. I’m usually very considerate as to not take pictures of people whom I don’t ask for permission first. That goes even more for people praying or medidating – but I have talked to so many other travelers who think it’s perfectly fine to take snaps like that. The experiene of so many people taking pictures of me – many without asking me for consent – made me wonder if I was sometimes being all too cautious about that. Don’t get me wrong here, I will always be respectful towards my fellow humans in that respect (and in others, too, I guess?! ), but I realized there that it’s nothing bad to be curious about people who are different from you and to show that curiousity, too, and be it with your camera. I have many times felt like an intruder to other people’s privacy when asking them if I could take their photo, but then – did I see all the lovely smiling people snapping selfies with me as invading my privacy? Sure not. So somewhere in between all these selfie-taking pilgrims, I realized that maybe if I found it charming and funny and overall not unpleasant to engage with people in that way, maybe I was making too much of a fuss about it when taking pictures myself. (How do you guys handle that when traveling? Do you just take pictures of everything and everyone around? Do you ask for permission or just restrain from it completely? I’d really like to know). Anyway, after having spend some time admiring the Golden Rock, there is not much to do furthermore if you’re a non-religious visitor. We decided to have some lunch and start with our hike because that would sure take some time and we knew it would get dark quite early. As we had been reading, the hike up was supposed to take about four hours, so we figured that going down couldn’t take much more than two or maybe three. Thinking about it now, I don’t even know where we took that number frm. Is that in any way an appropriate measurement? From our experience, it sure isn’t. When we started the hike, we were so delighted with the tiny houses you pass by, with children playing on the way (very keen to be photographed, too), but you also can’t help but notice that the people there are living under very simple conditions, although I am not sure whether or not to call them poor because I’m simply not informed enough. 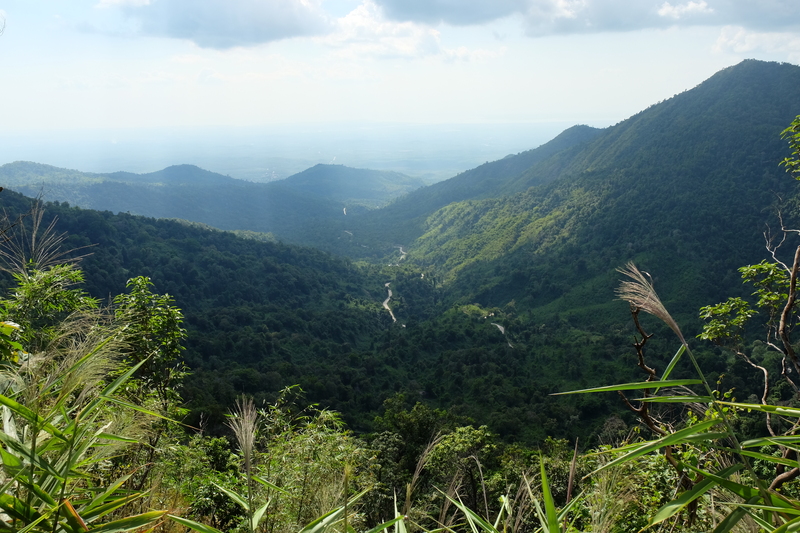 It was a very beautiful hike, leading us on between these little villages every now and then, but mostly offering incredible views on the vividly green mountain area around us. 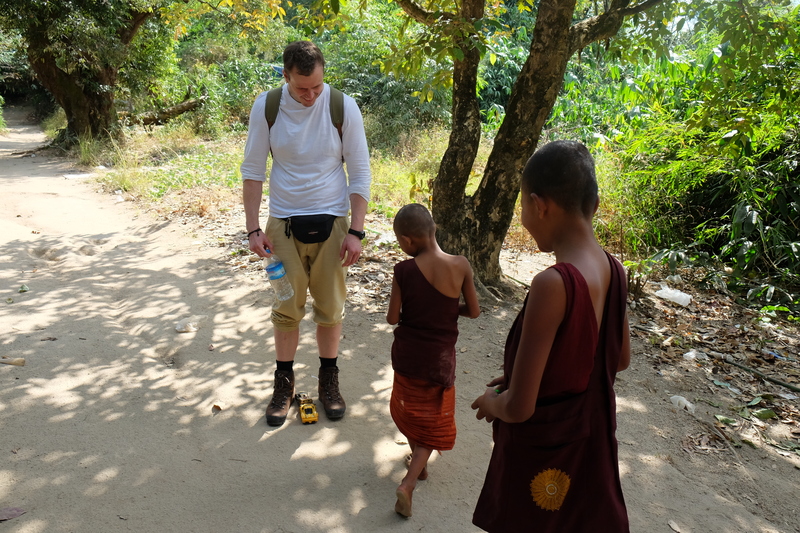 Many of the kids we encountered on the way approached us curiously: My favourite moment was when some little monks proudly showed us their remote-controlled toy car. The hike was brilliant and I can only recommend it to everyone, although I will be honest: It did take so much longer than we estimated – we made it to the base camp just in time for sunset and were SO DONE by that time. But I’m sure that if you’re prepared for the hike taking four hours, you’re gonna love it every bit of it (and not just the first half like myself maybe). The great part though: After having had such a long, exciting, exhausting day filled with impressions to process, we did NOT have to get on a bus to make our way back to Yangon, but instead returned to our beautiful garden sanctuary and made use of the last daylight to take a dip in the swimming pool that offered more great views. In my opinion, Golden Rock is so worth taking some time to visit and enjoy, and by the time we were getting picked up the next morning, we were not only filled with beautiful memories but also well rested and looking forward to new adventures. While I do understand that this is a highly personal account and probably our trip to Golden rock would not have been perfect for everyone, please feel free to get in touch if you need any advice on planning your trip there. I’d happily share the hotel’s name and/or other info with you. Thank you for your comment! I appreciate your feedback – but long texts are pretty much what I do around here 🙂 seems like you still managed to get through, so I take that as not too bad of a sign 😉 Cheers! thank you for this great tip! I will be in South East Asia soon and therefor I’m happy about recommendations of any kind 🙂 This looks definitely like something I don’t want to miss!